One of my most popular non-food posts on this site is this one, about memory keeping. I shared a lot of the different things I do to record memories and document life. One of the things I’ve learned is that the most memorable things in life don’t need too much help being remembered, because the events themselves are memorable: A 16th birthday, a family vacation, a wedding. It’s the little day-to-day moments that I really want to take special time to record and remember because those are the ones that are often overlooked, yet in the long run, are often most important. We live in an amazing time when technology makes it so easy to do just that. I wanted to share one more thing that I’ll be adding to that memory keeping post because it’s helped me to really record the little moments in my family’s life: Chatbooks! (Note: This isn’t a sponsored post, just something I’ve been loving and wanted to share.) These books are only $8 and ship for free. So much of our lives are recorded in pictures on our phones, but then what happens to those pictures? Like, me, many of you are posting photos to Instagram. It’s the fastest growing social media network right now and chances are, most of you who are using it, are using it to share photos of the day to day highlights in your life. I have been loving Chatbooks for taking those photos and doing something with them– affordably! One of the things the Chatbook App can do is connect to your Instagram account and automatically stream those photos into stylish little coffee table books. – it prints the date, location, and caption if you would like it to. – you can subscribe to an Instagram Series, which is what I do. 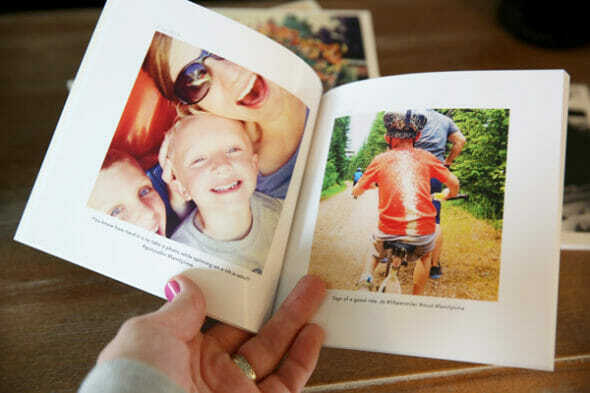 The little books can each hold 60 photos, so whenever you have enough photos to fill a new volume, Chatbooks lets you know and can send it right over. It’s like scrapbooking without even trying! The best part: The books only cost $8 each and they ship for free. Yep. -You can get any book in either softcover (shown here) or upgrade to hardcover. Another favorite feature is that you can add contributors, meaning you can combine more than one Instagram account into a single book. So if you and your spouse both have accounts, both of your photos filter right into the same book. 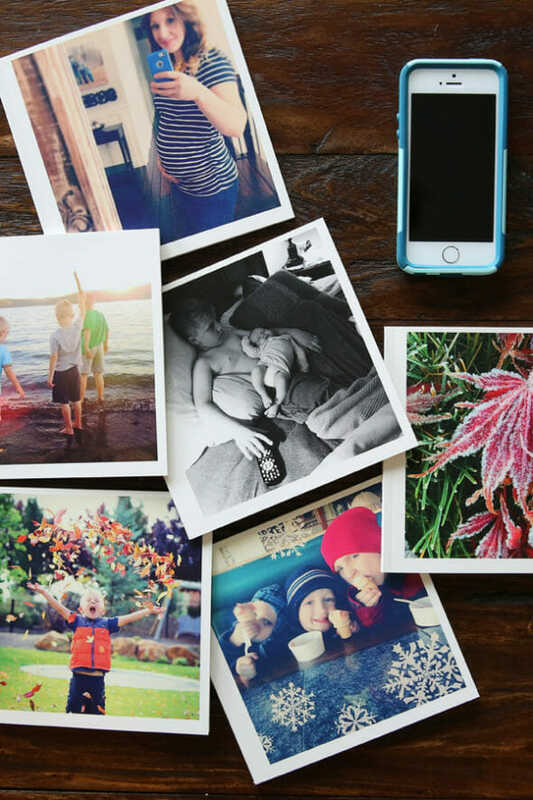 What an awesome thing to do if you have kids on Instagram as well; all of your family’s photos can be pulled together into little family albums. You can also do a (non-Instagram) Chatbook series. It’s basically like texting a photo and caption, and you can create a group so lots of people can contribute. Let’s say you’re on a family vacation- have everyone add their photos and you can all have a great photo book all finished when you’re done. You can do a family series and every time there’s enough photos to fill up a book it will notify you. Add a subscription for Grandma and Grandpa so they get copies when you do. Chatbooks also offers single, stand-alone books, and you can upload photos directly from your phone, or social media sites like Facebook and Instagram. So easy! 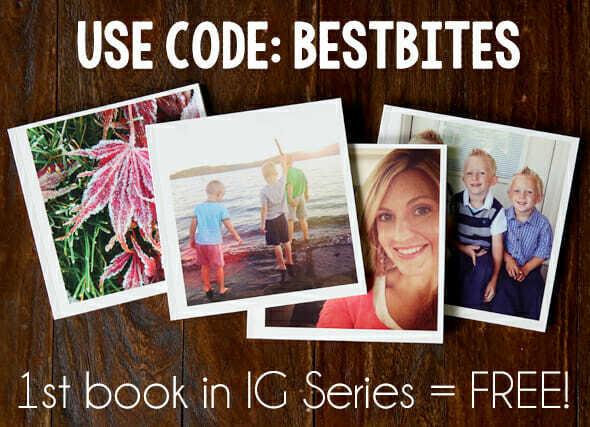 Check out the website and if you want to try it out, you can use the code BESTBITES when you subscribe to your Instagram Series and you’ll get your first book for free! I hope that helps someone out there get their photos on their table and feel good about documenting life! Through December 13th, get 20% everything with that code! 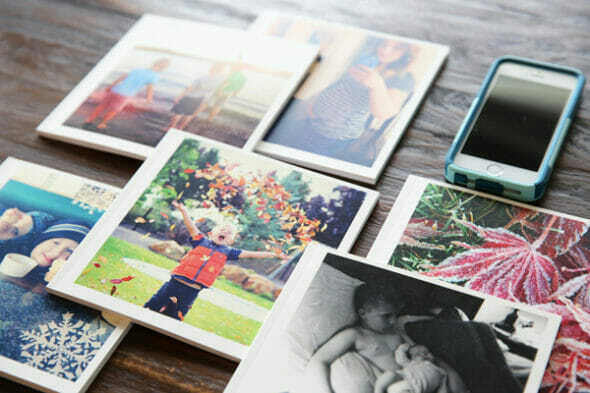 What other scrapbooks do you like that aren’t connected with our phones? I like the old-fashion way. If you are looking for a good yet also easy scrapbooking company I LOVE Club Scrap. They are a monthly kit type group and it comes with perfect directions to put them together “Assembly Line Style”. I don’t work for them or anything but I have been using their kits for over 10 years and I love the product and their customer service is amazing! Project Life has a traditional version as well as digital and an app. It’s been great for me this past year. You can buy their kits online or at craft stores like Michaels or JoAnns. I was just on their site last week considering downloading the app. Looks pretty easy, and I absolutely love having pictures around. I use Blurb to turn my personal blog into a hardbound book every year. I have five so far and am so thankful I’ve put in the time to create the books each year! Great information! I am wondering on the quality though. I have ordered a couple “brag books” from Walgreens and they have fallen apart (they are about the same amount of $). I am still in the stone age and don’t have a smart phone (GASP! ), but this is literally the #1 reason I want one! You are always in the know! Thanks! I’m addicted to chatbooks too!!!!! Hi Jessica, reading your post made me want to share with you that you may be more interested in My Social Book. Have you heard of them? My brother gave me one for Christmas and I love it!! There are some key differences that just depend on preference, but the My Social Books are bigger–like regular paper size I think, and you can do soft or hard cover but I’d definitely recommend hard cover if you have lots of pages. They’re also nice because you can do it yearly if you want. My brother did mine for the past 4 years or so of my facebook account and it had something like 400 pages for about $90 he said. I thought it was a great deal considering the size and page count! It easily just gets everything on your page including comments and you can click on anything you don’t want them to include, but otherwise it’s just super quick and easy. If you decide to check them out, definitely search the internet first because I see 20-30% off codes all the time (maybe even more, I can’t really remember right now). I think the quality is great and the book is so fun! Definitely worth checking it out if you haven’t already. =) Good luck! Just wanted to say thanks for this post and the one from last year, it took me a year to finally jump in but I’m using both the project life app and the paper kits. I love it and feel like I am finally going to be able to catch up on the family records and do something with our photos. Thanks so much! Now I wish I had an Instagram account! But I shared this on Facebook because it sounds AWESOME. Thanks for sharing. I love Chatbooks! 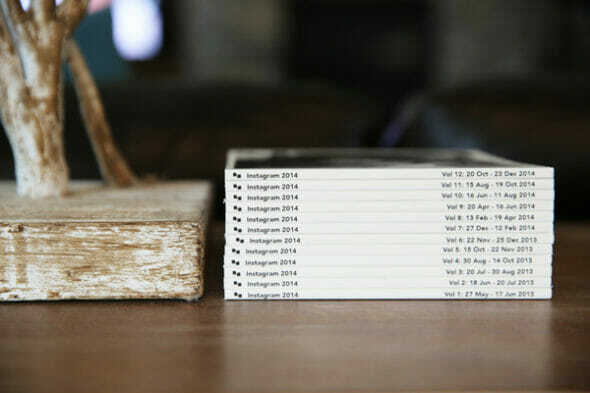 I just tried it for free through Tomoson and got 2 books full of Instagram Photos. It would have only cost $14 for both books and together they hold over two years of photos. I love that the dates are right there on the binding and on each page and I love that I had the option to leave a caption out. I only wish that I could have the option to replace an Instagram photo when I choose to exclude one. I didn’t see that option without it becoming classified as a “custom” book instead of an Instagram book. But I think overall that Chatbooks is definitely perfect for someone as unorganized, busy, and forgetful as I am.